They wore socks, arm warmers, loincloths and tunics; they even knew underwear! Fashion in ancient Egypt, like today, was changing. Wool was known, but the dominant fabric was linen. Dr. Aleksandra Hallmann talks about the clothes of ancient Egyptians. Egyptologists and archaeologists specialising in Egypt do not often talk about the clothes worn by ancient Egyptians. This topic is still poorly researched - scientists have long neglected it and focused on other aspects of this civilization, despite the fact that a lot of fabrics have survived to our times. Egyptologist Dr. Aleksandra Hallmann from the Institute of Mediterranean and Oriental Cultures of the Polish Academy of Sciences and the Oriental Institute in Chicago decided to explore this topic. In February this year the researcher organized an international conference in Chicago on the subject of clothing in various ancient civilizations. As for the clothes of the ancient Egyptians, she has important findings. "Egyptians most often used rectangular fabrics of various lengths and widths, which they wrapped in many ways around their bodies" - says Hallmann. But the known items also include socks, gloves, loincloths and even underwear - a triangular piece of fabric girded around the waist. The most popular clothing fabric was linen. But it was also used for other purposes: for wrapping statues for ritual purposes (for example the jackal in the tomb of Tutankhamun was wrapped in a linen tunic) and various ritual objects. Linen was also an expensive product in barter transactions. 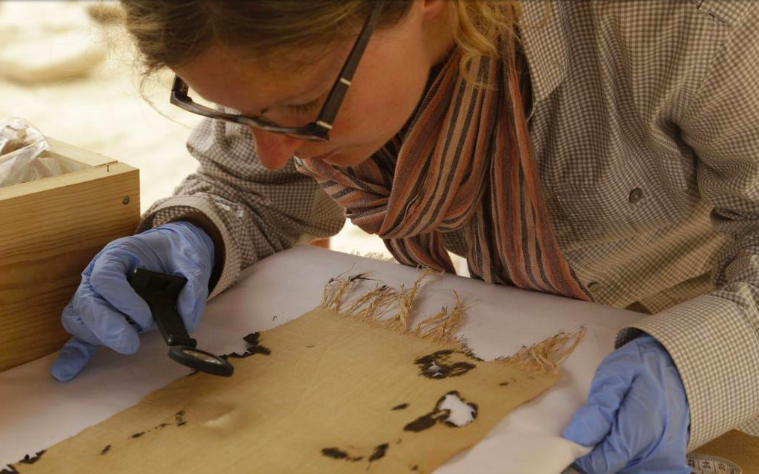 "Linen was present in almost all areas of life of the ancient Egyptians" - the expert says. The ancient Egyptians also used wool. Archaeologists sometimes find it during excavations within the ancient Egyptian settlements. Unfortunately, it is difficult to distinguish between the types of fabric on bas-reliefs. Because of the popularity of linen, scientists often assume that Egyptians were depicted in robes made of this fabric. "Linen cloth was used to wrap mummies. Egyptians used both long bandages made especially for the needs of a given burial, as well as bandages made of old fabrics that had been used as clothing. Some of them even showing traces of mending!" - says Hallmann. 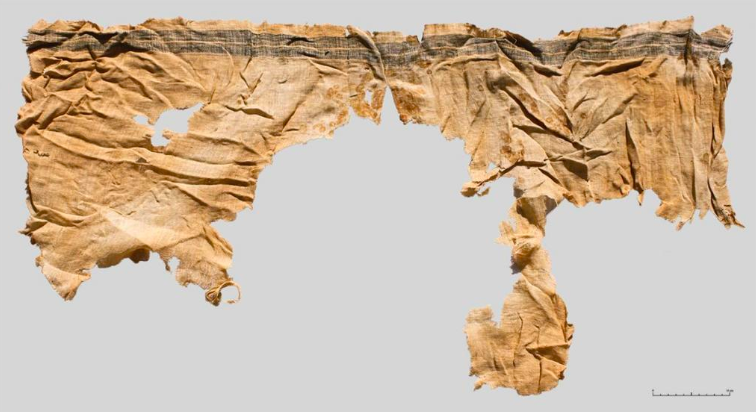 It was the consequence of the fact that fabrics were very expensive in ancient Egypt, so they were reused for various purposes, including wrapping mummified corpses. But there are cases when folded clothes were placed in boxes that served as wardrobes in the tombs of wealthy Egyptians. According to Hallmann, Egyptian clothing can be divided into two categories - wrapped and sewn clothes. The former were much more common . Egyptians knew tailored and sewn clothes, such as tunics, but most clothes were created by wrapping or draping of a rectangular piece of material. "Bas-reliefs depict women in dresses, but not a single sewn-up dress has been found during excavations. They were appropriately arranged and draped rectangular pieces of fabric, and not specially sewn clothes" - says the Egyptologist. An example of sewn clothes are simple tunics, worn by the Egyptians with varying frequency, depending on the era. These were rectangular fabric stripes folded along the short edge, stitched to the side. In addition, a hole for the head and a neckline was made. Sometimes separately sewn sleeves were attached. "Women, men and children wore such tunics. Their length and width, as well as their popularity, varied throughout the history of ancient Egypt" - Hallmann said. In turn, it was very characteristic for men to wear linen loincloths, called kilts or skirts in the professional literature due to the lack of the original Egyptian name. They belong to the same category of wrapped clothes as women`s dresses. They were draped from a rectangular piece of linen around the hips - reliefs and statues depict pharaohs, but also by farmers dressed in them. Their length changed over time - some were very short, covering half of the thigh, and some reached to the ankles. Kilts were often worn one over another, or together with a tunic. "Of course, fabrics had different quality and finishes, which also influenced their prices. Royal garments were more colourful and had more decorative elements, such as tassels or decorative hem" - says Hallmann. Due to the wrapped style of many Egyptian clothes, reliefs from tombs are very helpful in ancient Egyptian clothing studies, because they show finishing of clothes that is rarely preserved in the case of fabrics. Unfortunately, scientists sometimes encounter a problem, because decorative elements are often painted, not etched, so they fade over time. Hallmann believes that many elements of the ancient Egyptian culture have survived to this day. For example, the tunic is very similar to today`s jellabiya, a wide garment reminiscent of a nightgown, very popular especially in the rural Egypt. International conference on clothing in various ancient civilizations "Outward Appearance vs. Inward Significance: Addressing Identities through Attire in the Ancient World" was organized by Dr. Aleksandra Hallmann at the Oriental Institute in Chicago in February. Articles from the conference will soon be available free of charge. Abstracts of papers are available at the address.